The index opened flat and went down to touch the lows of the day around 7405, but saw the responsive buyers back in action to move the index back in green and close strong at 7498.75, gain of 38.15 points. The broader market though was negative with 668 advances to 873 declines. The range stays at 7000-7700. Call option 7400, 7600-7800 added huge 12.14 lacs OI with short covering seen at 7300 and below strike prices. Put option 7500-6700 added huge 24.23 lacs OI with profit booking seen at 7200 strike price. Nifty Open Interest is at 2,17,17,300 up by 1,22,400, with increase in price, most probably long build-up. Bank Nifty Open Interest is at 18,83,850 up by 59,610, with increase in price, most probably long build-up. FII’s sold 0.60 lacs Futures, which includes net 10969 contracts long build-up and 13372 contracts short build-up, with increase in net OI by 24341 contracts, includes 44957 longs to 47360 shorts for the day. FII’s Index future open contract as on date is 198539 Longs to 134346 Shorts, Net 64193 down by 2403 contracts. 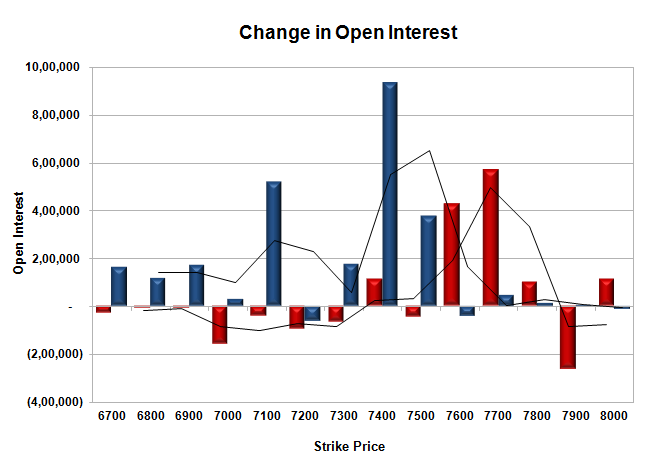 Initial strong support at 7400, with OI of 59.34 lacs and below that at 7300 with OI of 50.36 lacs. 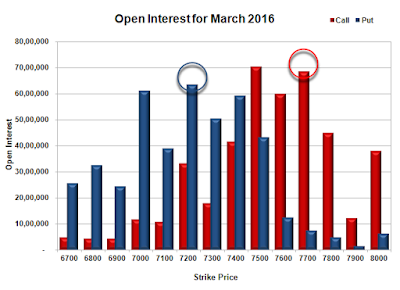 Initial resistance still at 7500, with highest OI of 70.46 lacs and above that at 7600 with OI of 60.02 lacs. 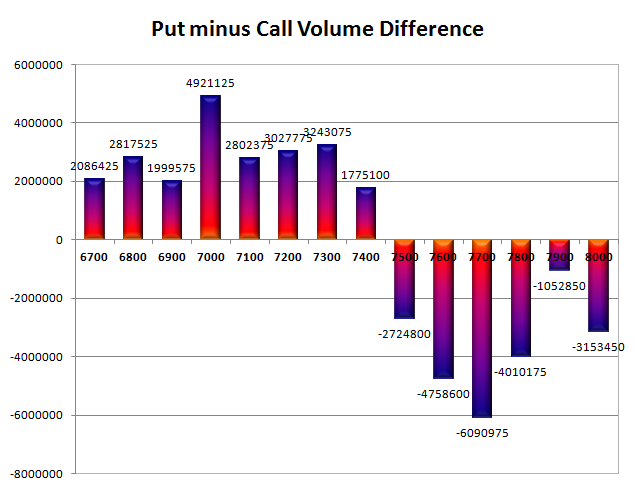 Day Range as per Option Table is 7400 - 7555 and as per VIX is 7430 - 7568 with 7471 as the Pivot.